Hello, First I would like to congratulate you for this blog, it´s very, very helful. 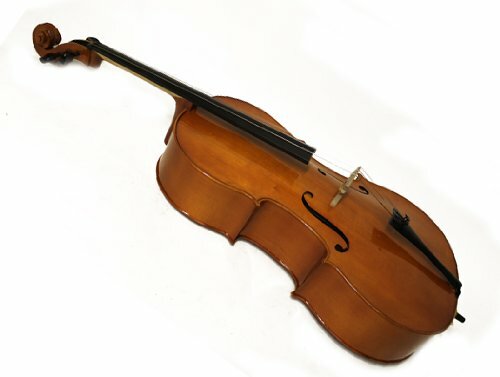 I am a beginner on playing cello, I play other instruments like piano or guitar but I´m about to get my first cello. I have been looking for months and I have some questions about the ones you recommended on this post. What is you opinion on the Archer cello? I have heard both really bad and really good opinnions about it. Have you, or one of your students, play an Stentor Arcadia? I have understood it´s the next step after the Elysia. Thank you for this post and your time. Firstly, I must apologise for taking so long to get back to you – I have just moved house, so have been surrounded by chaos! From my experience, there is a good reason why you have heard such divided opinion on the Archer cello – the build quality is very inconsistent on these instruments, with some having a reasonable basic setup (but still requiring tweaks) and others requiring LOT of work on the setup including the fingerboard, topnut and bridge; and quite often the soundpost, endpin and tailpiece. The setup issue extends to all student instruments (some requiring considerably more work than others) regardless of what retailers and less experienced players might tell you. You may be able to get some reasonable sounds out of the box, but a substandard setup will soon interfere with your progress, and can cause damage to the instrument itself. While the Archer cello appears to be good value for money and has certain advantages over some other instruments in this price range (solid wood construction and ebony fingerboard and tuning pegs), the price of the instrument is only the start. The factory strings are pretty dreadful, the bow is barely adequate, and some if not all of the setup issues mentioned above will need to be addressed. I am familiar with the top end Stentor instruments including the Elysia and Arcadia. I haven’t seen or played one made less than 10 years ago, so can’t comment on the quality of recently made instruments. The ones my students owned were good sounding and looking (if a little over-varnished) cellos with characterful sound and scope to improve with age, making them good upgrade instruments for players entering their intermediate phase (around grade 5) looking for a cello that will take them to grade 8 and beyond. For many amateur players, instruments like these are the ‘final’ upgrade, but it all depends on what your ambitions are, and of course, your budget. It is worth mentioning that the price difference between the Elysia and Arcadia models has more to do with superficial ‘improvements’ – a bit of a manufacturer’s con. Both instruments are individually hand crafted under master maker supervision and there is no difference in the quality of build and materials. The price difference (normally around £500 – £700) does not represent a £500 – £700 improvement in sound and playability, the latter of which depends much more on the individual and a good personalised setup carried out by a skilled luthier. I hope that helps, and I wish you the very best with your cello journey! Thank you for your replay! I have been accepted into a local music school for next school year. It is what my pocket and location can afford (they get the 6 year old students first, and then the rest so i was lucky to get a spot because I´m 19) I know the cello teacher and she seems very nice and really into her students so hopefully it will be great. There are individual 30 minutes classes. I will ask her too of course when I but the cello. I will probably go for te Arcadia. I wouldn´t mind to get the Elysia however I olny found one store which has them (around 60 km away) and they only have the Arcadia but they do the set up and if anything goes wrong I can always go to the store and complain xD. Also, the price difference here in Madrid, is only about 150 pounds, and it feels safer to buy it on person. I will probably buy the bow online, I saw you recomended on this post the amazon shop Violins4you and they have also good reviews so I may get it there, and the case too as well as other accesories. The cases Jakob Winter JW 8033 and Roth & Junius RJCC-BK seem nice and strong enough, considering it will only travel by car and bus. Again, thank you for your help and keep writing on this blog, as I said it has been very helpful.